"Generate tons of puzzles with Magnum Opus." Are you in the mood to play some classic puzzle games? If so, Magnum Opus may be for you. Get back to the classics in this large, customizable collection of games for your Windows PC. With over 24 different puzzle games included, it really is a beast of a collection. Play classic titles like Crossword, Crossquiz, and Akari when you download Magnum Opus. And if you don’t remember how to play the games, or never learned how, there’s a friendly help button that will get you a bit more familiar with the game and you’ll have mastered it in no time. If you do remember these puzzles, Magnum Opus will take you back to the good ole’ days, back to your childhood. Puzzles have, for a very long time, been a great way to learn and have fun at the same time. Crossword puzzles are known to have a positive effect on your vocabulary. Several people have reported an expansion of their vocabulary after playing crossword puzzles. 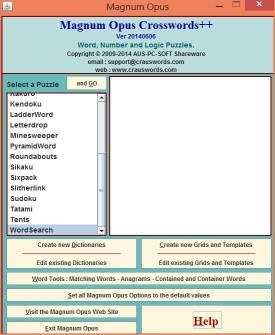 Kick your crossword playing up a notch with Crossquiz. In this game every clue is a challenging quiz question. Don’t worry, you’re provided with a bit of a cheat as Google Search is available to you to help out with most difficult items on the board. Some games like Akari and Minesweeper are very similar and you will enjoy playing both. In fact, the design for the modern day Minesweeper game that comes standard on every Windows system prior to Windows 8, is in line with that of Akari and not the classic Minesweeper. Sudoku is a great numbers puzzle and it will have you entertained for hours. The objective of Sudoku is simply to fill the board up with numbers. However, that is a lot easier said than done because you can’t have the same number in the same row or column. And just when you think you have placed the right number in the right spot, you haven’t. One of the more classic and commonly referred to as the easiest puzzles to complete are Wordsearch puzzles. There isn’t much brain power that goes into simple spotting words in a grid of letters. With Magnum Opus, however, you are in control of the difficulty. Contrary to popular belief, a Wordsearch puzzle can become very difficult if you start including diagonal words, overlapping words, and backwards words. If you happen to be a web developer and you wish that you could get these puzzles on your site, listen up. One cool thing about Magnum Opus is that the games are publicly available and they can be shared on your site absolutely free without the fear of any legal mess to come from it. You can easily export any of the puzzles and include them on your site. 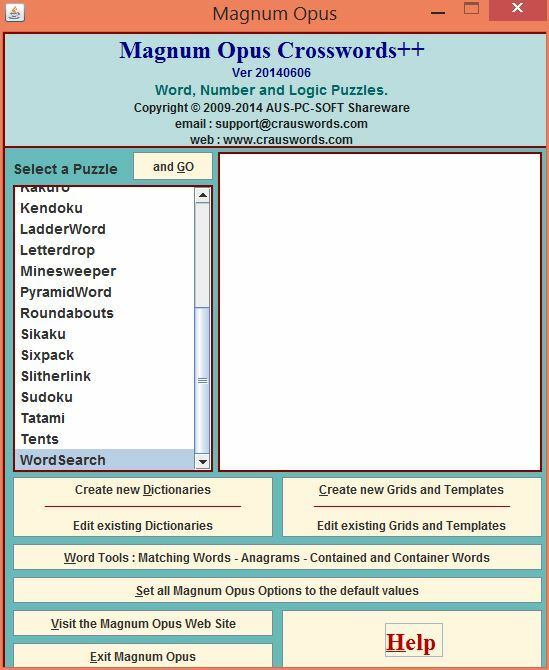 Last but not least, you can create and customize dictionaries in Magnum Opus. This gives you a truly unmatched, customizable experience so that each game is completely different from the last one and a bit more challenging.